Two sided print. Front pocket has red Sopranos logo which is about 4" wide. 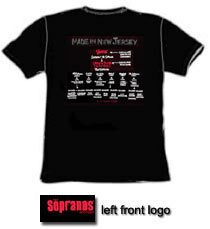 Back of the shirt reads "Made in New Jersey" and has the official "family" tree as of Season Three including the six "Capo" crew members and eight "Soldiers". Several of the family members listed on the back have the notation "deceased" under their name. Black, 100% cotton. Only size small left in stock. Sopranos - mob family tree tshirt from Season 3 of the HBO Show.